The biggest and last football game of the season will take place in a few days … Super Bowl! There will be parties, pizza delivered, many bags of chips opened, avocados smashed for guacamole, etc. Don’t forget to serve something sweet, too! 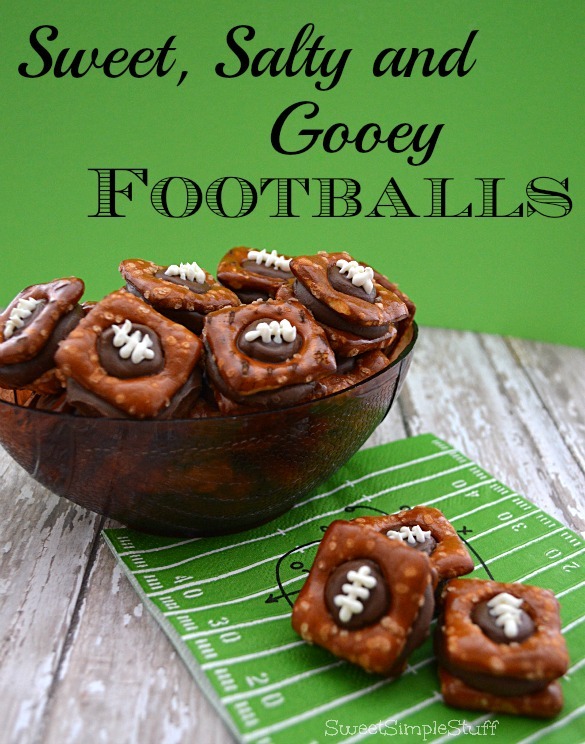 I have got the perfect solution for that sweet snack … Sweet, Salty and Gooey Footballs! 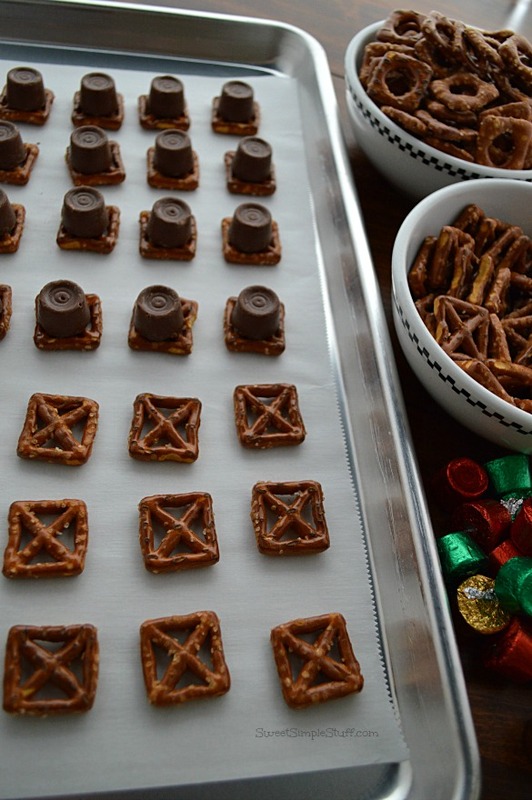 I used the same Tic, Tac, Toe pretzels that I used in the Hugs and Kisses Snack Mix…XOXO and the XOXO Hugs & Kisses … Pretzels + Rolos. 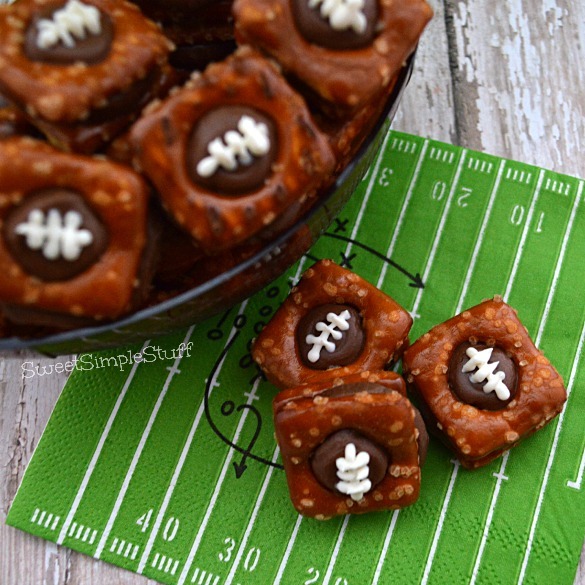 The idea of these footballs popped into my head as I was putting the hearts and lips on the Hugs & Kisses … Pretzels + Rolos. 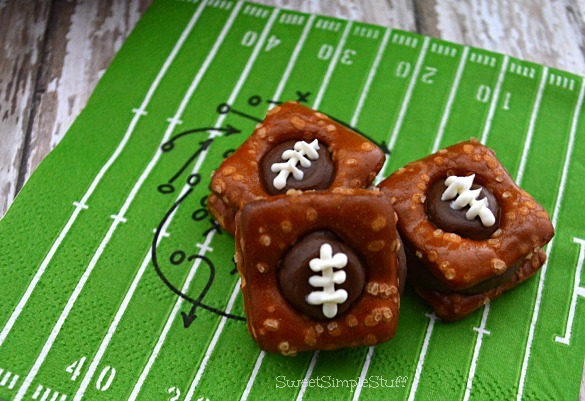 The “O” pretzels aren’t a perfect circle … they’re a little more oval-shaped, like a football! In fact, these are made just like the Valentine treats … don’t add the heart or lips … add laces instead! Unwrap/remove foil from Rolo candies. Sort out whole pretzels (broken ones make great snacks), 50 X’s and 50 O’s. Heat oven to 350°F. Line a baking sheet with parchment paper or foil. 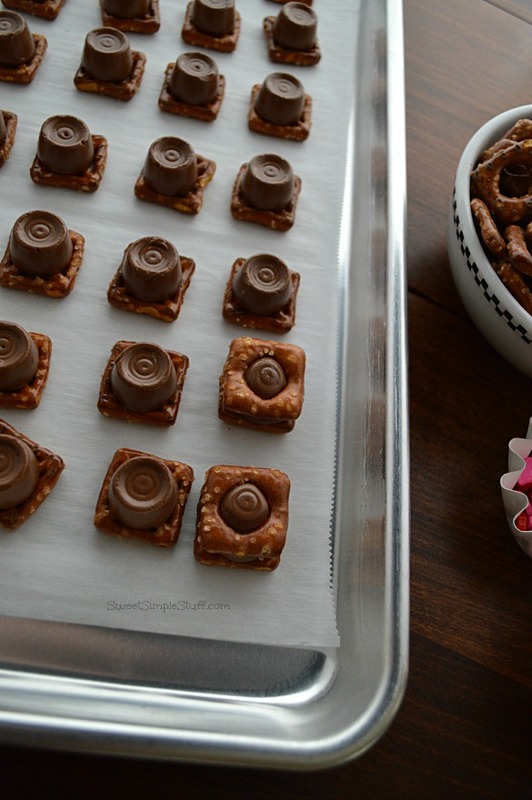 Arrange X pretzels on prepared baking sheet and top with a Rolo. Bake for 3 to 5 minutes … just until candy is soft and slightly melted. Remove from oven and top each Rolo with an O pretzel, press down slightly. Let cool until chocolate hardens or pop them in the fridge for a few minutes (be sure that the baking pan is cooled). Melt white candy according to package directions and place in squeeze bottle or disposable decorating bag. Draw laces on football. By the way … I just announced the winner of the heart cake pan that I used for the Cookie Lover’s Bark. If you have a chance, read the interesting comments that were left … seems like cake pans should be called multi-purpose pans! Are you going to watch the big game? These are adorable and would cure any craving for something salty and sweet! Thanks for sharng!! Oh, Yum. I love rolos. What a quick and easy snack to sneak off with handful of these yumminess. 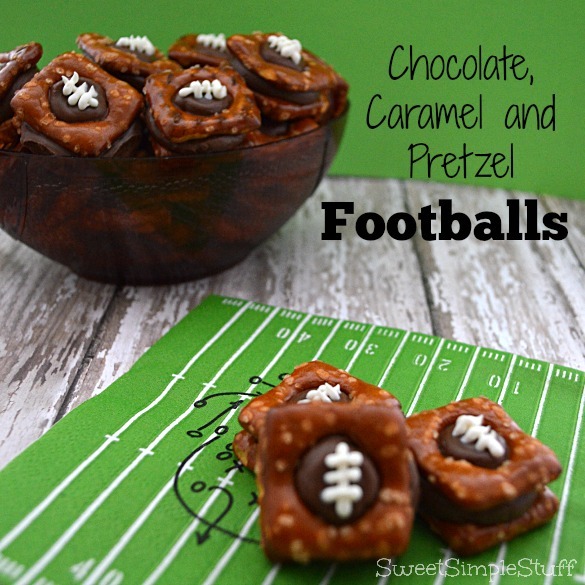 They are pretty footballs and yummy too, I’m sure. 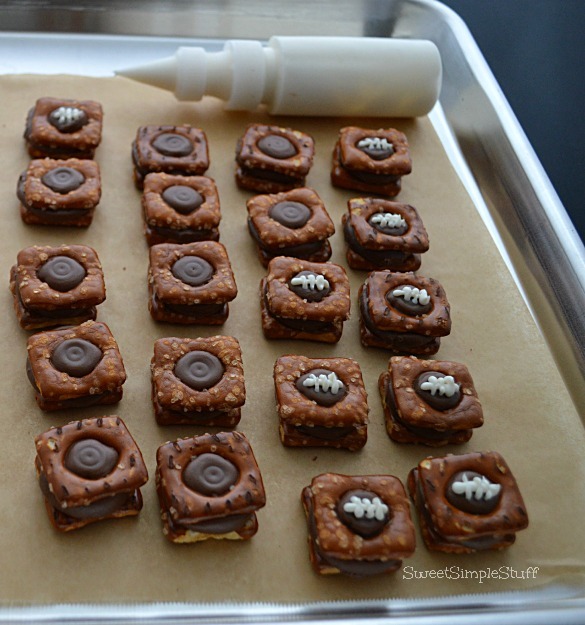 What’s not to love about chocolate, caramel, and pretzels. Thanks Beth … footballs should be pretty, don’t you agree? I wouldn’t miss not watching the game and seeing the Seahawks come with a Big Win.